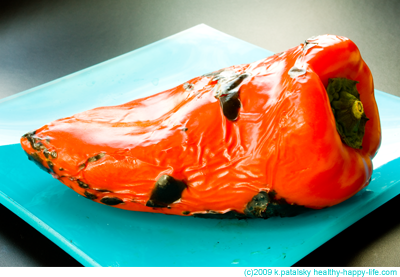 There are two ways to roast a pepper at home. The gas stove top method and the broiler oven method. 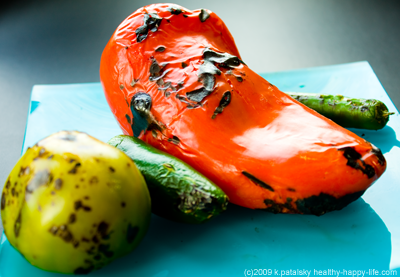 You can roast anything from a bell pepper, jalapeno pepper, tomatillo, Serrano pepper and more. Roasting brings out mellow warm flavors and softens the acid in the ingredient. Recipes that call for roasted peppers include Italian pasta dishes, antipasto salads, and Savory Roasted Red Pepper Soup. And a thick slice of a red roasted pepper can easily bring a lunchtime sandwich to life! 1. Wash and dry your pepper. 2. Turn on gas to medium heat. Flames should not be touching pepper. 3. For large peppers: Lay the pepper directly on the iron grill. Turn every few seconds with tongs until an even roasting has occurred. Skin will be bubbly and wrinkled with black char marks. For smaller peppers: Apply to skewer or fork. Hold over flame and rotate peppers every few seconds. 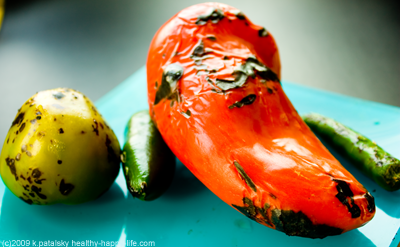 Smaller peppers will roast faster than large ones. Safety first! Always stand far away from the flame and try to turn your face from the heat. Sometimes the popping of the skin and seeds can cause bits of the pepper to fly off the stove. Be aware and be careful! Allow peppers to cool slightly before doing any peeling or chopping. 1. Wash and dry peppers. Slice in half. 2. Place on foil or cookie sheet, skin side up. 3. Heat oven to broil. Place peppers in oven. 4. Allow to broil until skin bubbles and wrinkles. This process could take anywhere from five to twenty minutes, depending on the pepper size and oven heat. When removing peppers from oven, be careful. They will be hot! That's it! It is incredibly easy to roast, and it really brings out mellow, warm tones in an ingredient.